Manufacturers are coming under increasing pressure from direct customers, end consumers, competitors and regulatory bodies to improve the sustainable development of their operations. A 2010 study by the European Polymer Dispersion and Latex Association (EPDLA) concluded that 80-90% of the environmental impact of an emulsion polymerization business can be directly attributed to the raw materials consumed. While a polymer manufacturer can still improve business sustainability by other means – such as reducing water usage, greenhouse gas emissions, net waste and nonrenewable energy consumption during manufacture/transport – the most effective route towards becoming truly sustainable is clearly to research, develop and promote more sustainable monomers and other raw materials into the marketplace. Performance – From a polymerization viewpoint the new monomers must be easily processed and give clean, fully converted reactions. In the end application the new monomers must offer comparable performance to current oil-based systems although, of course, if application properties were enhanced then this would be still more advantageous. Availability – The new monomers must be readily available – initially perhaps not in large quantities, but there must be a clear plan to upscale new raw materials to meaningful quantities and within a defined timescale. Cost – The price must be relatively close – or projected to be relatively close as the volume increases – to that of current oil-based equivalents. It is likely that these biobased monomers will, however, continue to increase in volume and so eventually reduce in cost towards that of mainstream monomers. Taking the view that increased exposure to the market can only be beneficial in highlighting the work going on within the industry, Synthomer is committed to evaluating and advancing any and all potential sustainable monomers. 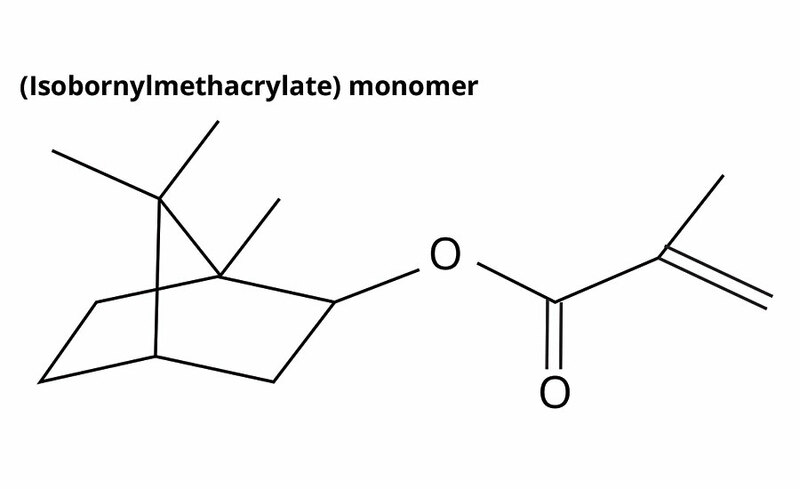 2-octyl acrylate (2OA) is produced by a patented process involving the reaction of 2-octyl alcohol – as a waste product from castor oil-derived alkyd synthesis (the castor oil itself only grown in areas unsuitable for food crops) – with acrylic acid to form 2-octyl acrylate, with an established biocontent of 73% (Figure 1, Table 1). The monomer is inherently hydrophobic in nature compared to e.g., n-butyl acrylate (BA), and therefore would be expected to show advantages in terms of water resistance properties over the oil-based BA monomer. Isobornylmethacrylate (IBOMA) is intended as a partial replacement for hard monomers such as styrene. IBOMA is 71% biorenewable content with a (homopolymer) Tg of 150 °C (Figure 2, Table 1). Emulsion polymerizers typically have a wide range of polymers, covering many different monomer combinations, stabilizing systems and end-target applications. In order to effectively screen new monomers, careful consideration must be given to selection of prototype polymer systems and resultant application testing. Scale of sample can also influence end properties of the polymer, hence all samples described here were produced on the same laboratory reactor. “Standard” reference versions containing the oil-based acrylate or styrene equivalent were also produced to give as fair a comparison as possible. In all cases, substitution of the relevant monomers was done via a weight/weight basis. In this study, oil-based acrylates were substituted by 2-OA in three alternative monomer systems. In all cases the polymerization proceeded smoothly to give clean, low-coagulum, low free-monomer systems and with consistent particle size. In general it was found that direct w/w substitution of BA by 2OA gave slightly higher MFFT/Tg results (due to the difference in the theoretical values for BA (-55 °C) and 2-OA (@-44 °C). This can be adjusted by a modest increase in the level of 2OA (such as in the samples ST3 and PA3 described below). Reference polymer (VA1) was approximately VA/BA 75/25, conventionally stabilized with a protective colloid (cellulose ether) and anionic/nonionic surfactant package. With a measured Tg of 16 °C and film forming temperature of 4 °C, the polymer is intended for solvent-free interior paint systems. Three variants on 2OA were produced @50% substitution of BA (VA2), 75% (VA3) and 100% (VA4) substitution respectively. Table 2 details emulsion and application properties. Increasing substitution of BA by 2-OA (on a w/w basis) leads to slightly higher Tg and MFFT – this is due to the difference in the theoretical values for BA (-55 °C) and 2-OA (@-44 °C). Particle size varies slightly, but this is generally in line with expectation of a colloid-stabilized system. Overall the use of 2-OA leads to lower emulsion viscosity in this system independently of particle size, and this suggests the monomer may have an effect on other parameters such as the extent of colloid grafting. Despite the hydrophobic nature of 2-OA no significant advantage in water uptake (on the polymer films) was observed. In the basic paint testing (Table 2) it can be seen that, although the paint viscosity varied slightly, this could not be attributed either to particle size or to the emulsion viscosity. In contrast to the emulsion film tests there is a definite decrease in water uptake of the dried paint films with increasing substitution of n-BA by 2-OA. In the semigloss formulation a reduction in gloss could be seen with increasing 2-OA levels; again, this is independent of particle size. However, gloss reduction can also arise from many interactions with other raw materials in the paints, and is being investigated further. In the high-PVC matte paint, properties such as viscosity, storage stability, opacity, etc., were similar to the standard. There is, however, a slight but definite trend of improved scrub resistance with increasing 2-OA, which would be expected from the more hydrophobic nature of the monomer compared to n-BA. Reference polymer (ST1) was approximately 40/60 styrene/n-BA, conventionally stabilized with a standard anionic/nonionic surfactant package. With a measured Tg of 11 °C and zero film-forming temperature, the system is typical of a polymer intended for high-PVC, solvent-free matte paints. Two biosubstitutions were also prepared; ST2 is direct w/w substitution of n-BA by 2-OA; ST3 is the same but with increased 2-OA to match the theoretical Tg of ST1. Table 3 shows that the 2-OA samples (ST2 and ST3) gave finer particle size and slightly higher viscosity than the standard (ST1). Despite the difference in theoretical Tg between n-BA and 2-OA the Tg of ST2 (w/w substitution) was similar to the standard (ST1) and with slightly lower film forming temperature. ST3 (higher 2-OA) showed a further reduction in both Tg and MFFT. A significant advantage in lower water uptake was observed with ST2 and ST3 compared to the standard, ST1. Although the basic emulsion stability of all three samples was similar, the 2-OA versions gave noticeably better stability to silicone emulsions (wasserglas) than the n-BA standard. In the evaluated paint systems the basic properties (Table 2) were similar, with all three emulsions showing identical viscosity and good storage stability. Varied scrub resistance results were obtained, however it would still be expected that, overall, a slight advantage should be seen with 2-OA compared to n-BA. Reference polymer (PA1) was approximately 50/50 MMA/n-BA, conventionally stabilized with an anionic/nonionic surfactant package/functional monomers, and produced via an external seed method. Two variants were derived on 2-OA: the first (PA2) was direct w/w substitution of n-BA, the second (PA3) was similar but with an increased level of 2-OA to match the theoretical Tg of the reference standard, PA1. The particle size of the samples was consistent (Table 4), as expected with an external seed polymerization, however the 2-OA samples PA2 and PA3 both showed significantly increased emulsion viscosity. Significantly lower water uptake was again seen with 2-OA compared to n-BA (via the polymer films). PA2 (w/w substitution) gave higher Tg/MFFT and lower elongation compared to the standard – this was expected due to the difference in theoretical Tg between the two monomers – however this is easily rectified by the inclusion of slightly more 2-OA (PA3). Although the high-shear viscosity of all three paints is similar, there is a definite increase in the low-shear viscosity with the paints on 2-OA binders (Table 4). This is to be expected, given that the more hydrophobic nature of the monomer will show increased response to the HEUR thickener employed. Gloss in this system is consistent. A waterborne reference acrylic (i.e. with raw materials from nonrenewable sources) was chosen as the starting point for these investigations. This reference acrylic was a self-crosslinking dispersion characterized by heterogeneous morphology, was formaldehyde- and APEO-free, and was designed to be suitable for industrial interior wood coatings requirements. It was based on 2-ethyhexyl acrylate (2-EHA) and styrene, representing more than three quarters of the final polymer, and the system was manufactured by free radical emulsion polymerization utilizing a redox initiation system. The polymerization of a number of biobased variants proceeded smoothly, and with good conversion. Basic properties such as solids content, viscosity, pH, mean particle size and water uptake of the polymer films, etc., were measured. However it was found that, when substituting IBOMA for styrene, the minimum film formation temperature could not be determined on a standard MFFT-bar (0-70 °C). It is well known that substituting monomers of different composition can affect both the reaction kinetics and the resulting polymer morphology in multiphase polymers. Therefore, some modifications to the process were necessary to derive prototypes with more comparative film forming temperatures. From this, four derivatives of the reference acrylic with increased biorenewable content were polymerized (Table 5). In RB25 the soft monomer (2-EHA) was exchanged for 2-OA (Table 2). In RB30 the hard monomer in the outer shell was partially substituted by IBOMA (Table 2). In RB55B the changes in both RB25 and RB30 were combined, along with some process modifications to offset the higher MFFT of the original sample (RB55A). (Note: RB25 = “Renewable Binder @ 25% biocontent, etc.). 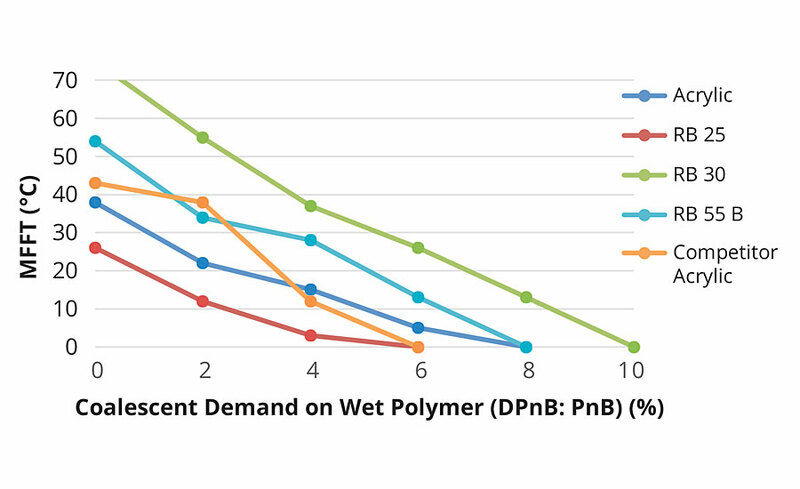 The relative coalescent demand of the prototypes was determined by incorporating various levels of a coalescent blend (50:50 DPnB:PnB, based on wet polymer amount by weight) and by measuring the subsequent MFFT values (Figure 3). Extrapolation of these results further confirms that IBOMA-containing polymers (RB30 and RB55B) have higher film forming temperatures than their styrenated equivalents. Chemical resistance – EN 12720, DIN 68861-1B, IKEA R2 and R4. Measured 60° results were very similar for the prototypes, however overall those containing IBOMA showed slightly lower gloss. This could be due to the difference in reflective index of styrene (1.55) vs. IBOMA (1.48). 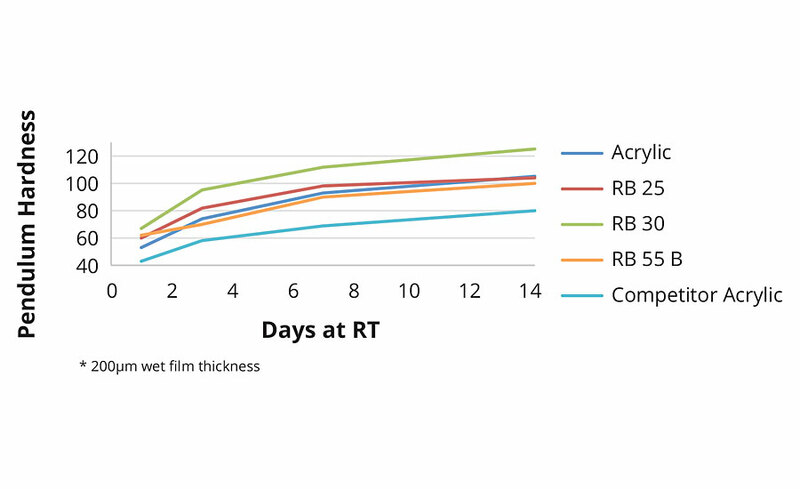 From Figure 4 it can be seen that the reference acrylic clearly out-performs the (single phase) competitor acrylic. RB25 with 2-OA shows similar hardness development to the reference acrylic, despite the lower MFFT (and lower coalescent demand) of RB25. The higher film-forming, IBOMA-containing, RB30 naturally shows further improvements in film hardness, although results for RB55B are curiously low. 200 µm wet coating was applied on a glass panel and the hardness was measured after 1 day and 14 days drying at room temperature. 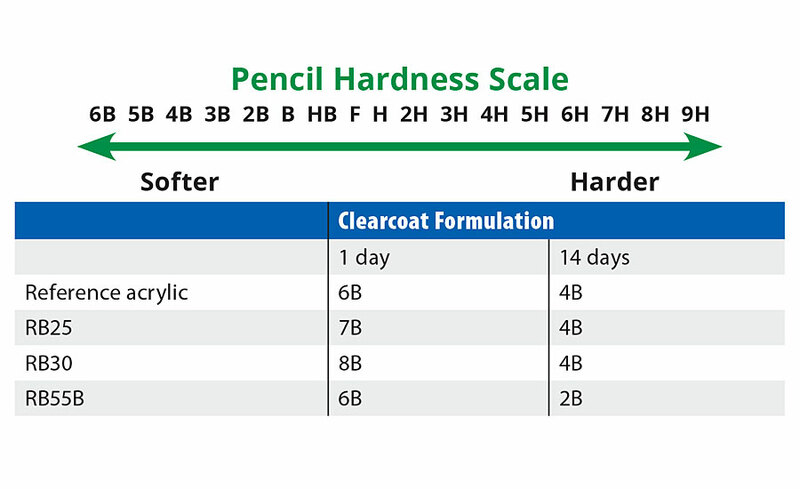 According to the standard EN ISO 15184, pencil hardness ranking scale is given in Table 6. From Table 6 the pencil hardness of RB25 is slightly lower than the reference acrylic (but note again the lower MFFT/coalescent demand of RB25). Interestingly only one of the two higher MFFT binders (RB55B) shows improvement in hardness values via this test. Indeed the “hardest” binder (via Konig) – RB55B – is two units harder than reference acrylic after 14 days. The chemical resistance properties of the coatings were tested over Beech Veneer panels via 2 x 200 µm wet films (cured at elevated temperatures). Evaluation was via DIN 68861-1B and IKEA R2/R4 test/assessment methods. In the clearcoat formulation (Figure 5) the overall chemical resistance of the reference acrylic was slightly superior to the prototypes. 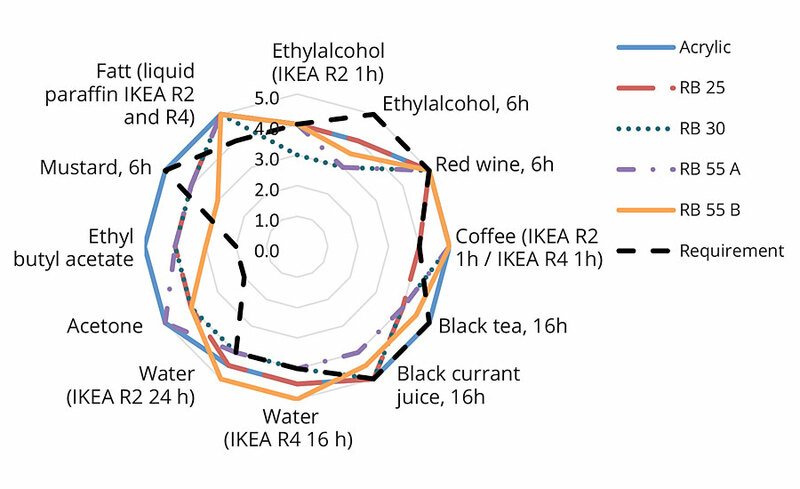 However all the samples were able to fulfil the requirements for red wine, acetone, ethyl butyl acetate, water and paraffin fat for IKEA R2/R4. Of the biobased derivatives the 2-OA, containing RB25, proved slightly less resistant to coffee but better against alcohol than the IBOMA-containing versions. It is likely that, with some refinements, further improvement in chemical resistance can be made to all these prototypes. Performance – 2-octyl acrylate shows proven compatibility with a variety of monomers and stabilizing systems. The resultant products polymerized smoothly and gave clean, fully converted polymers. Application results suggested there were no significant drawbacks in using 2-octyl acrylate and, indeed, in many systems the more hydrophobic nature of the monomer could be of benefit in terms of better blanch resistance, lower water uptake, higher response to HEUR thickeners, etc. IBOMA, however, may subtly change the reaction/morphology (of a multiphase polymer) and this then affects the end properties. Further investigation/refinement of the recipes will be required to produce a comparative evaluation against e.g. the reference acrylic. Availability – these monomers are currently in the up-scaling stage. Current availability is therefore somewhat limited, but could increase significantly as and when demand increases. Cost – the indicative prices of these monomers are currently higher than oil-based acrylates. However this is expected to come down as the availability and demand increases. In summary, the coatings industry is moving towards greener and more sustainable technologies. These initial investigations demonstrate the potential for achieving the same level (or better) performance with biorenewable monomers that is currently achievable with oil-based equivalents. Commercial viability, however, ultimately depends on how “real” the interest is in such sustainable raw materials within the industry itself. A version of this article was originally published in the European Coatings Journal.